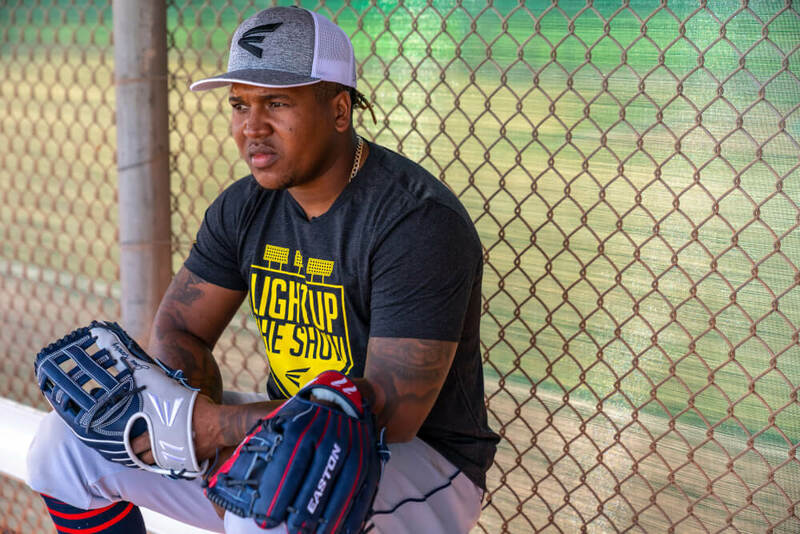 After making a splash last season with the signing of Astros’ star Alex Bregman and Indians’ MVP candidate Jose Ramirez, Easton is building even more momentum for the 2019 season. Their 2019 glove lineup was designed by Easton’s glove team in consultation with the players, and some of the common elements include contrasting thumb accents, gator leather, and an off-set Easton logo. A trade to the New York Mets over the offseason brought All-Star Closer Edwin Diaz to a new team and a new glove company. After previously wearing Rawlings, Diaz is wearing a 12″ D46 dual-hinge pattern in bright royal blue with an orange Easton logo. His three gloves take full advantage of the Mets’ blue and orange combo. Diaz is gaming the blue one with black laces (above right), but his blue and orange accented camel piece should not be denied. He also has a blue and orange-accented variation. All told, a solid set of gloves for one of the most electric relievers in the game. Another Easton new comer, Pittsburgh Pirates backstop Francisco Cervelli is using a 32.5″ H25 catcher’s mitt in a simple black and gator accented makeup, along with Easton gear behind the dish. After making the switch to Easton last year, Rangers’ Outfielder Delino DeShields will be rocking a 12.75″ H-Web F73DD fastback pattern. The H-Web is the major league standard for outfielders, and DeShield’s incorporates Rangers colors with added elements like gator on the thumb and pinky accents. Seattle Mariners’ First Baseman Ryan Healy’s 12.75″ K70 Double Bar Post mitt is an absolute beauty. Keeping it simple with camel leather and tan laces pays off; sometimes simpler choices are the way to go. Another player embracing the reptile skin leather trend, Kansas City Royals’ Shortstop Adalberto Mondesi has already been wearing this 12.25″ C51 I-Web. The combination of blue and camel leather pops off the screen and looks great out on the field with the Royals’ uniforms, too. The Cleveland Indians’ Jose Ramirez has two options: an 11.25″ C11 I-Web and a 12″ C43 H-Web. While the 12″ pattern will inevitably get more run at third base, the I-Web really stands out: the red gator leather on the thumb is flashy and compliments the navy blue back and palm nicely. From the looks of it though, it appears Jose is still sticking with his game model from last year, the Navy and Red H-Web from above. With his trade to the Giants’, you can bet that Kevin Pillar’s 12.75″ F73 H-Webs with blue leather accents will likely not be making it on the field this year. His all-tan model on the right-end is an absolute smoke show, though, and it would be a travesty for that bad boy not to make it out on the field, blue accents be damned. Like Jose Ramirez, Pillar is sticking with his glove model from last year (second photo). The camel and black option is available at JustBallgloves.com. While its not the best look with Giants unis, Pillar is concerned with one thing. Catch the ball. Diamondback’s middle infielder Ketel Marte is wearing an 11.5″ C21 I-Web. Ketel received two very different pieces. A subdued all camel piece with gator skin on the thumb, as well as a flashier scarlet model with a silver patent leather thumb accent. Through the early going, Marte has gone with the scarlet and silver option. The patent leather definitely stands out. Will it catch on? Rocket arm Ramon Laureano also signed on with Easton, and has two different 12.75″ F64 gloves with a “Grip-T Trap” web (top right and below). The camel and green one with yellow laces is an infield glove. The green and camel outfield model (black laces) has a standard back, while the black is fastback. All three are pretty saucy. He’s been gaming the black one so far this season. It’s a pretty straightforward look, but with the way Laureano throws, he doesn’t need much to stand out. Aside from the Pillar glove, we haven’t seen any of these for sale yet, but we’ll keep an eye out.